2018 saw EPA take a series of actions meant to clarify, revise, and streamline the New Source Review (NSR) program, continuing the Agency’s momentum from the previous year. NSR is a permitting program under the Clean Air Act that imposes preconstruction requirements on certain major sources of air pollutants. As part of the Trump Administration’s regulatory reform agenda, EPA’s Regulatory Review Task Force pointed to NSR as a program that too often imposes significant costs and regulatory uncertainty for subject facilities and identified seven program areas ripe for reform. In March 2018, EPA issued a guidance memo entitled, “Project Emissions Accounting Under the New Source Review Preconstruction Permitting Program,” setting forth the Agency’s interpretation of the way emissions changes from a project should be accounted when determining if NSR applies. The March 2018 memo provides that emissions decreases, as well as increases, should be considered when determining if a project would be subject to NSR, clarifying an issue that has been approached inconsistently in the past. Then in November 2018, EPA took a final action to restore a 2009 EPA action that described the principles of project aggregation that EPA would apply when determining if a source had unreasonably segregated a single project into multiple projects for purposes of avoiding NSR. 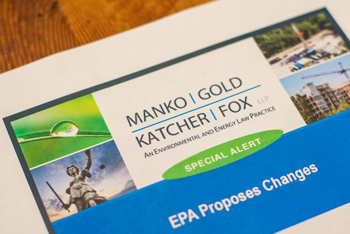 The November 2018 final action completes the Agency’s formal reconsideration of the 2009 action and reaffirms EPA’s interpretation that only “substantially related” changes should be considered a single “project.” Although EPA has styled both the 2009 and 2018 actions as “final,” EPA has not proposed to revise the definition of “project” in the NSR regulations. In addition to the above-mentioned NSR reform actions, EPA opened 2018 by issuing a January guidance memo withdrawing a 1995 memo known as “once in always in.” While not directly related to NSR, the January memo is consistent with the goals of the Regulatory Review Task Force in that it is meant to provide flexibility to sources subject to Section 112 of the Clean Air Act by allowing former major sources of hazardous air pollutants to avoid major source requirements when they reduce their emissions below statutory thresholds, a practice prohibited by the 1995 memo. As of the time of this writing, congressional efforts to amend the NSR program have proved futile, and EPA has not proposed to revise its NSR rules to incorporate its recent policy pronouncements. Therefore, while the regulated community may look favorably upon EPA’s commitment to NSR reform, sources should be mindful that EPA’s actions to date are only guidance that may be abandoned by a future administration. Likewise, state permitting authorities, which are tasked with reviewing and acting upon permit applications under the NSR program, do not have any obligation to adhere to the NSR guidance memos, or the memo reversing EPA’s longstanding “once in always in” policy. Accordingly, source owners and operators need to evaluate carefully whether a proposed project would be feasible even if a state permitting agency declines to review the project through the lens of the recent reform memoranda. Moving forward, it is reasonable to expect EPA to take additional NSR reform actions, as the Agency has yet to address most of the items identified by the Regulatory Review Task Force. But given the lack of statutory and regulatory changes to date, the lasting impact of these NSR reforms remains to be seen.